So, what has happened since err, umm.. November? First place to look is at my photos folder, which, at the moment is in a terrible disarray. Sigh..
[… Scanning thumbnails … ] Right, Christmas, let’s start there. The holidays were fun, despite this being the second year that we stay in Europe for Christmas. It’s the hardest time of year to be expats, away from family and friends we love and miss. But hey, we had some crazy snow. Me and Little A in the backyard. This is the first year that we bought a Christmas tree (and a mini tree and a wreath and ornaments and lights). Little A visited Santa, at our gym, but sadly, there was no cardboard tree. Christmas morning, with new boots from Grandma, and new toys. It gave our spirits a boost when D’s parents came just after Christmas. They caught a cold on the plane (of course), and it made it’s way around to all of us during the following week, yuck! So I starting thinking about gifts early… like a month ago.. but did I buy anything? Not so much… And now I’m officially competing with all the crazies since it’s after Thanksgiving. Luckily, I’m doing most of my shopping online. And I’ve spent some “mental time” on the process… that has to give me at least a partial leg up on the task.. Right? For the past couple of years, by the time the 21st of December rolled around we had already visited at least one family a little bit. Had already endured at least two full, fully cramped airplane rides and survived the customs lines in Atlanta (most often) or Chicago (once or twice). The Christmas party for my side of the family for this year was on Saturday, and we joined them for a few minutes via webcam so that my grandmother and aunts and uncles could see the newest family member. Luckily the party started at 2 p.m. (8 p.m. here) so we had a small window before her bedtime. It got really frigid here (-10 C), but we braved the cold and filled up the refrigerator. We played on the floor and read books. All three of us took naps. Some deep cleaning was done in the bathroom. Oh and we had an excellent dinner last night, and excellent wine too. So nothing particularly special made this weekend special. I’m hoping for more of the same for the coming week! I have to add, since it just popped in my brain, 3 month-olds are really fun. And for me, well, I’m starting to feel more adjusted to this new routine. As we folded a bunch of clothes this weekend, newborn clothes that this baby won’t ever wear again, it hit me how fast this time is going and to really appreciate it. Best wishes for everyone this week! A few weeks ago I was pondering whether to decorate this year. Because remember, in theory, we won’t be living here next Christmas, and combined, we own three ornaments. After deciding I’d be a little mopey if we didn’t, I rallied up a few ideas that would take little to no storage after the fact. D gets credit for helping me figure out the “tree” top last night, and for hanging the star! A little summary of our Christmas break. It’s gotten long so I’m dividing the trip in half. If nothing else it provides a historic reference. Hah! We flew 9.5 hrs to Chicago. Somehow in Dusseldorf we lost my second boarding ticket so we had to scramble to figure out where to go withing Chicago airport. When you have a connecting flight and something goes wrong, doesn’t it feel like your life suddenly turned into an episode of the Amazing Race? Turns out it was United ticketing we needed, even though we booked through Lufthansa. Our flight from Chicago to Tampa was over-booked and United was offering free flights but we didn’t go for it – there was an ice storm about to hit the area and we had a rental car and a hotel waiting for us in Tampa. We arrived to a balmy (humid) Tampa around 9 p.m. and picked up a G6 midsize car from Alamo, which is a little tradition for D and me. For the last 3 years we have used this rental agency and always go for the G6 if it is available. Our G6 had satellite radio this year though, which was a bit of a bummer because we just wanted to listen to the local Tampa radio. hah. we walked across the parking lot to the Bahama Breeze just next door. We split the Calypso shrimp – it’s so GOOD there. Basically it’s shrimp and linguine in a spicy cream sauce. MMMmm. It was late, maybe just after 10 p.m. when we arrived. Once again, we were amazed at the difference between European and America dining experiences. The whole meal took a total of a about 20 minutes. She’s a ball of energy but sweet. We dropped our stuff in the guest room and I checked out the packages I had shipped there. Shortly after, my grandmother arrived and we decided that D and I would go to the bank to take care of that errand and then we’d all go for lunch at Gulfport beach, my grandmother’s stomping grounds. We ate at a place called O’Maddys. Surprisingly it’s not Irish. We had sandwiches at an outdoor table to enjoy the sun. Florida in December is really a-w-e-s-o-m-e. To think, I spent my whole childhood not realizing this fact. Later, around 5, we all visited my grandmother’s dog park, also in Gulfport. This was D and my first dog park experience. This dog park is basically two fenced in areas, one for the big dogs and one for the small-medium sized dogs. To enter, there is square, fenced-in area, with a double gate, so the dogs inside can’t get out while new dog-and-dog owner’s enter. We were there for about 1.5 hours, and the peak, which was around 6 p.m., there were ~20 dogs. Wowsa. Everyone on my dad’s side got together at my grandmother’s around 1 p.m. for the official pre-Christmas shindig. We had ham, salad, corn casserole (which has become the traditional side dish for this family), green beans, baked beans, rolls, etc… I brought out some German desserts that were well received also. We saw my cousin’s son, Jackson, who was born earlier this year, and he is a wide blue-eyed cutie. D always finds my grandmother’s yard a wonderland – since within it resides a key lime, tangerine, AND pink grapefruit trees. The key limes either ripened earlier in the year or never came, but there were beaucoup de tangerines and big fat grapefruits galore. After the party, D and I drove to Tampa to drop the rental car and continued to Inverness, Florida where we’d spend the week at my mother’s house. and living room, then went shopping for food for the week. On Monday, D, my sister Liz, and I went to the nearest mall, about 35 minutes away in Ocala. We didn’t get an early start and then our stop at Olive Garden for lunch took quite a while. Waiting for lunch at Olive Garden? Yes, it happens. There was so much traffic though, that we deemed the wait reasonable. Later, after my sister Amanda got off work, we all went to see the movie Twilight. Twilight was okay. It was a little intense in a strange way. I think someone watching it that had not read the book would think it disjunct. By far, the most annoying thing to me was Jacob’s bad wig job, right?!?! They really thought they sold that look? Meh. we dropped D at the apartment’s basketball court, for which he was thrilled, while us girls went for another round of last-minute shopping. I’d rather play basketball than shop on a normal day but spending time with my sisters was fun. Once the shopping was accomplished we picked up D and headed downtown to Total Wine. Think a giant store of just wine. We bought 4 bottles: three reds and one Chardonnay, and again I saw the wine glasses without stems. This is the new trendy thing? D and I made baked salmon for the family Christmas Eve dinner. Publix generally has good quality fresh salmon by the way. We were expecting 9 for dinner so we bought 3 lbs of salmon, to go with farfalle (bowtie pasta) and pesto, and a salad. My sister Liz made this spinach artichoke dip recipe for an appetizer. If you like cheese, you will love this. We ended up having 6 for dinner because my mom’s friend couldn’t attend, my grandmother was tired, and my sister Amanda had to work, but we still managed to finish ALL the salmon. Hah. We proceeded to open presents once all were awake. Everyone got cool stuff. Discussing the gifts would take too long but everything was well-received, yay! Then we commenced with cooking a turkey and all the sides. I wanted to try the upside down baking method I’d read about at Simply Recipes. Success! Even flipping the turkey for the last 20 minutes went off without a hitch. Friday was our last full day in Florida. Liz, Amanda, D and I drove West, in search of manatees. Instead, we found a closed manatee refuge (just closed for the holidays I think). We drove West again, to the marina where I know you can rent boats by the hour but we were turned away again. The rental shop said the tide was too low for renting boats and that we’d probably run aground unless were were headed directly at the spring head for diving, which wasn’t our mission for the day. Sigh. So instead, we drove even further West to the beach in Crystal River. D had the foresight to bring along his swim shorts so he went swimming while the rest of us just waded. It was hot outside and there were hundreds of seagulls in the air. Ended up borrowing an extra small suitcase from my mother, to make it a total of 4, to carry all this stuff! Then we drove to Tampa International to depart for Canada! Continued in Christmas 2008 Part II. For all you United Stations. I’d say I’m jealous, but that’s kind of obvious. Though I’m not getting any turkey this year, I heard that this year Thanksgiving on my mom’s side is going to be at my grandmother’s, and on my dad’s at Uncle Fred’s, per usual. Don’t worry about the economy on Thursday, D and I will be working and holding down the fort for y’all. This week at work has been kinda strange for us here too. It’s been feeling holiday-lax around here on my project even though there’s no free days until right before Christmas. Maybe everyone hit the Christmas market a little too hard over the weekend – it opened on Friday in Aachen and runs until December 23rd. We were freezing out butts off but we were drinking hot German spiced wine called Glühwein, which really does chase away the cold. The boot glasses we’re holding up are part of the tradition. Cute no? I went again on Friday for a quick visit with a coworker who was leaving last Sunday and wanted to check it out. What’s amazing is that the market is open everyday from now until just before Christmas. It’s a big tourist attraction and I’ve heard more than once that the Aacheners are happy when the market starts and equally happy when it ends. It’s alot of congestion for the downtown area I guess. A picture taken in Quebec a few years ago. Winter can be so beautiful. I did my hair this morning, even though I had no where to be. The blond is okay. Anyway, it is brighter, I kinda like it. My favorite will always be red, but blond has a nice hollywood feeling. Red with blond seems beyond the salon stylists here (and beyond my budget right now too!). Here’s an older picture of the red and blond how I like it. I’m going to switch to a Christmas stylesheet, a couple of weeks of red and green, or snowflakes, sounds nice, especially since we have no decorations in our apartment here. I’m about done with the whole shopping thing, it wasn’t so bad really. Just a few things left to decide. I think the worst part is the pressure we put on ourselves to find a perfect gift. Or in some cases, you wait too long, and you are just trying to find any form of a suitable gift. I’ve been in both places. Ideally, I try to give a feeling of being a kid on Christmas to the people in my life – a surprise or something they really would want. It’s about finding something you know will give them a little thrill. A guy from work laughed at my face when I tried to explain this one to him at lunch. He doesn’t think this is really possible I guess. 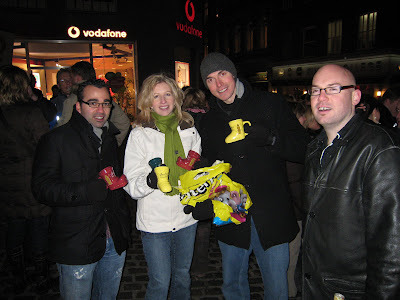 He is from Montreal too, and is buying bottles of gluehwein and boot glasses to go along as a mass group gift to his family. A different approach but it sounds nice to me. My families aren’t much for drinking, either side, which is funny since my grandmother spent her life owning a bar (probably a good thing!) So this idea would flop for me, but it sounds cozy and nice, these little boot-shaped glasses are fun. The holidays are celebrated a little different here. Germany is one of the original advent celebrators, with the markets and the chocolate calendars used to countdown to Christmas. Here, Dec. 6 is St. Nicholas delivery day, he leaves fruit and chocolates in the shoes (stockings) of good little girls and boys. Usually it is left on the doorstep (no reindeer or chimney requirements involved). Then Christmas eve and day are more religious, but gifts are still exchanged then.